Our eyes are one of the most fascinating and complex parts of our bodies. The fastest working muscle we have, eyes have been systematically developing for the past 500 million years. Much like a camera, our eyes work by bending light rays through a lens, focusing the light onto a highly attuned sensor called the retina. The retina modifies the light from raw data into electrical impulses, which it then directs to the brain through the optic nerve. In fact, we don’t see with our eyes at all, but with our brains! This highly refined system of sight is one of the grandest designs of nature. The human eye has the ability to function at 100% capacity at any given moment, without needing to warm-up or rest. Our eyes are made up of over 2 million working parts and, in the right conditions and lighting, can see the light of a candle from up to 14 miles away. It’s pretty easy to say that our eyes are amazing. However, over 37 million adults in America suffer from some sort of eye diseases, such as macular-degeneration, glaucoma, and diabetic retinopathy, which can lead to visual impairment, or even blindness. According to the 2016 National Health Interview Survey, around 10% of all adult Americans reported they have trouble seeing, even while wearing their glasses or contact lenses, or that they are blind or cannot see at all. Today, 80% of vision problems worldwide are completely avoidable, or even curable. Just like eating healthy and getting the proper amounts of physical activity, taking care of your eyes should be a priority. Healthy vision can keep you safe, just as keeping your eyes safe can keep you healthy. From keeping up with regular comprehensive eye exams, to wearing proper eye protection while at work or play, vision health is important for those of all ages. • Get regular comprehensive and dilated eye exams. • Because some eye conditions are hereditary, take care to know your family’s eye health history. • Eat right to promote healthy eye function. Dark and leafy greens and fish high in omega-3 fatty acids are among the best foods for your eyes. • Stop smoking. According to the American Academy of Ophthalmology, smoking directly affects the ability of the eyes, including the increased chance of Age Related Macular Degeneration, cataract formation, glaucoma, as well as Dry Eye Syndrome. • Maintain a healthy weight and lifestyle. Diabetes is the number one cause of blindness in adults worldwide. • Wear sunglasses. Prolonged exposure to UV light can increase the risk of cataracts and age-related macular degeneration. Make sure to purchase sunglasses that block out 99-100% of both UVA and UVB rays. • Wear proper eye protection while in the workplace, playing sports, or taking part in activities such as painting, cleaning, and doing home repairs. Most importantly, encourage others to take care of their eye health. Just 1 out of every 7 preschool children receives an eye exam, and less than 1 out of every 4 receives any sort of vision screening. An estimated 11 million Americans age 12 years and older could see better if they used corrective lenses. Imagine the things we could see if we all took charge of our eye health and preservation. Take care to practice healthy vision this month, and every month. 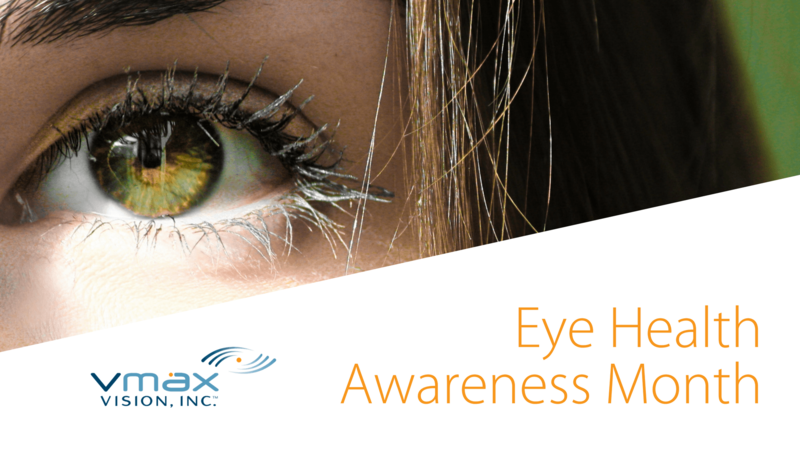 Spread the word—it’s healthy vision awareness month!